Layered under something makes this look a little more feminine and less lumberjack! This just screams hoe down, which isn't what Im going for! I’m not even a Nirvana fan, but I thought this title would be appropriate for my outfit today since I’m rocking the plaid flannel shirt. I tried this shirt once before, but ended up looking like a crazy lumberjack. I haven’t given up though- the plaid flannel shirt is a popular look and I’m determined to make it work! I decided to layer it under a casual dress, to change the look of the dress, and add some warmth. On the right is my first attempt. I tried it with this cute tiered/ ruffled black dress, but I think this looks a little like I’m heading to a western themed party. On the left I have it under a different black cotton dress. This one has a cute gathered waist, a scoop neckline and sleeves. I’ve got on black tights and my ever favorite black boots. I think it works- well, sort of! I like it, but I’m a little hesitant. As I say in my ‘about me’ I’m not a big risk taker, so this is a little out of my comfort zone! Please tell me what you think! Is this something you would wear? Should I give up on my flannel? 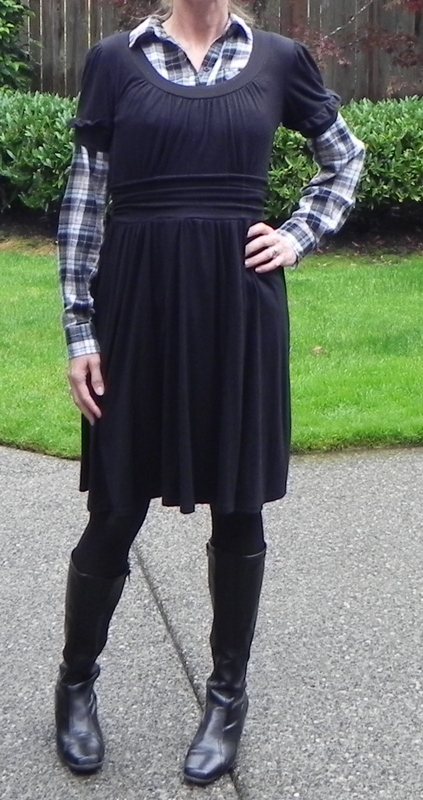 To me, the flannel shirt makes the dress very casual, perfect for a weekend look. I have it buttoned to high though! Loosen up a bit, huh?! I wonder if a necklace would help? My favorite shirt in 7th grade was plaid flannel. It had a ruffled collar, which made the plaid more feminine. The contrast between the fabric and the style made it work with high-waisted jeans and Bear Traps. I wore a dainty gold Sunny Star necklace hanging over the high ruffled collar. I didn’t think about any of this stuff at the time, of course. Fashion comes naturally to 7th grade girls, right? You crack me up- and it sounds like you were a very fashionable 7th grader! You’ve brought back lots of memories with this description- hilarious! I recently found your blog and I love how you do two shots – one “basic” shot and then one “better” shot. It definitely helps me see ho a little something more can tie things together. Speaking of tie, what if you did the scoop neck dress, flannel on the outside, and tied the flannel at the waist in a knot? Maybe with a red necklace to draw the eye up? For some reason my brain thinks that would work…not so lumberjack with a splash of girly. I like your suggestions, thanks! I’ll try that! So glad you found my blog- and that you like it! Thanks so much for commenting, and for suggestion an improvement! I appreciate it! I’ve decided this outfit isn’t working- I felt awkward wearing it- and I never want to feel that way. I want my clothes to give me confidence! So, that being said, you will NEVER see this look again, I promise! I think black ankle boots/ booties would be great with this instead of the knee high boots. Also, I think a big honey-brown satchel would be a cute addition. Oh good idea! I just got black booties- (see Oct 11th post), maybe that would have worked better. Thanks for the suggestion! I really appreciate it!